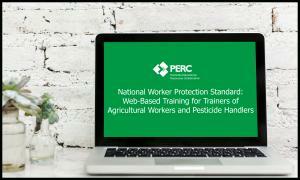 A web-based national Worker Protection Standard (WPS) course to qualify trainers to train both workers and handlers is now available from the Pesticide Educational Resources Collaborative (PERC). The course, available at http://pesticideresources.org/wps/ttt/course/index.html, provides the necessary information and procedures to provide effective training about pesticide safety topics. A course fee of $35 covers the cost of the hosting, course maintenance, and certification management. Iowa State University is working with PERC to transition to the new course. The ISU WPS Train-the-Trainer online course will no longer be available after October 15, 2018. Anyone who has previously completed the ISU online course does not need to complete the new PERC course unless they want to be qualified to train pesticide handlers in addition to workers.